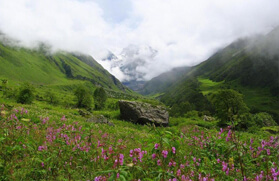 A journey passing through a diverse landscape that is coated with lush green undulated meadows and dotted with wild flowering plants, the Gorson Bugyal Trek is one of the most popular treks in the Garhwal Himalayan region with alpine meadows and is a treat to the eyes. 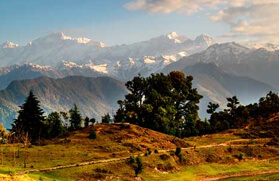 The journey is further enriched by the whispering beauty, flurry of colours and majestic view of the Nanda Devi massif. The array of Himalayan trees like Deodar and Oak is a sight to behold. 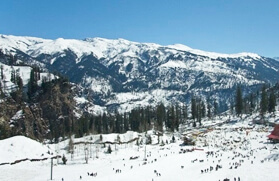 Nonetheless, the gentle slopes of Auli, during the winters, when blanketed with snow, turn into a popular skiing destination and woo the skiers. 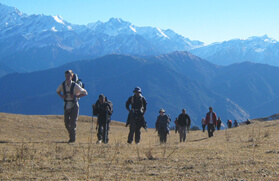 The Gorson Bugyal Trek uprising and maneuvering from Auli commences from the spring season and continues till autumn. 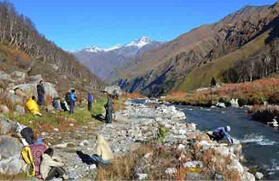 The trail from Auli to Gorson Bugyal, which is one of the easiest treks in the Garhwal Himalaya, is only 3 kilometers long and one can spend hours camping in the rejuvenating atmosphere. We will start our day a little early in the morning and leave for Delhi railway station to board AC train from Delhi to Hairdwar. On reaching, meet our tour representative who will be there for your welcome and thereafter to transfer you to your already booked hotel/guest house in Rishikesh. Check in at the hotel/guest house. The rest of the day is free at leisure. 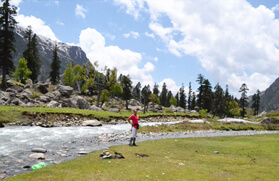 During your free time you can explore the natural beauty of the place and take a holy dip in River Ganga. Enjoy a relaxing overnight stay in the hotel/guest house in Rishikesh. Today, we will have an early morning breakfast in the hotel and afterwards, leave by road for Joshimath via Devprayag, Rudraprayag and Karnprayag. On arrival, check in at the pre-booked hotel. The evening is free for your own leisure activities. During your free time, you can visit the local markets or explore the scenic beauty of the place. Later, return back to the hotel for dinner and an overnight stay. 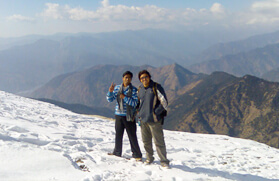 After breakfast in the morning, today we will transfer you to Auli by Ropeway which will be exciting and adventurous. Joshimath - Auli ropeway is India's highest and longest ropeway that covers a distance of about 3.96 km. You can capture endless stunning views of the beautiful Himalayan mountains like Doonagiri (2,400 meters), Gori Parbat (6,708 meters), Mt. 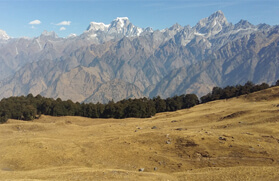 Nanda Devi (7,816 meters), Nar Parvat (5855 meters), Neelkanth (6,596 meters), Bithartoli, Hathi Parbat, and Kamet. 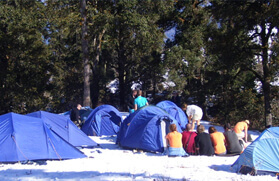 On arrival, check in your already booked hotel in Auli and enjoy dinner followed by an overnight stay. 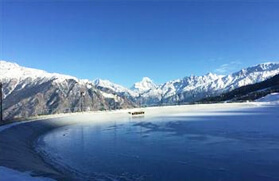 The next two days are fixed for exploring the beautiful Auli, one of the famous tourist spots of India and having an ultimate trekking experience. We will start our day quite early and finish our breakfast quickly to proceed for our first trekking experience. 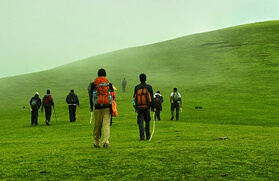 We will trek uphill till Bugyal located at a height ranging from 2591 meters to 3049 meters. 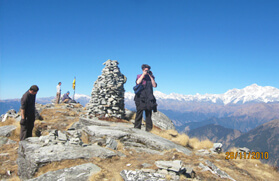 From here, once can witness the complete range of Himalayan's peaks. Later, we will head back to our hotel. The evening is free at leisure. During your free time, you can either rest in your hotel and take pleasure of its morning activities or walk out to explore the place and its hidden beauty. An overnight stay in the hotel in Auli. In the morning after breakfast, we will board on a journey to Joshimath via ropeway. On reaching, we will drive straight to Rishikesh, which is about 8 hour long journey. Later on reaching Rishikesh, check in the hotel and have a relaxing overnight stay. On the last day of our trip, we will leave early in the morning for Haridwar railway station to catch AC Train to Delhi.